BENGALURU : Fifty years ago, Palini T’s family shifted to Kamakshipalya to start a powerloom unit. He had been a bookkeeper earlier at one of the handloom units in Cubbonpete, once city’s cloth weaving hub. “It was difficult in the beginning, I got credit from relatives and started with 3 machines,” says Palini, now the owner of a unit with 16 machines. Palini is lucky, his sons have agreed to carry on the family business and his profits are not as affected by the new Goods and Services Tax. 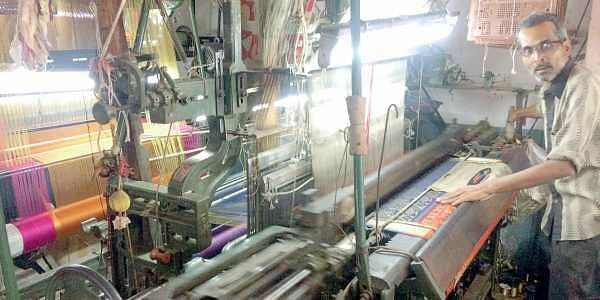 But most of the neighbouring looms in Bengaluru’s powerloom centre – spread across Kamakshiplaya, Kamalanagara, Kare Kallu and Vrushabhavathi Nagara – are shutting down unable to cope with the paperwork and financial strain. Most houses here have one or more powerlooms fitted into them, alongside kitchens or living rooms. And a worker is employed by the owner to run each machine. The gloom started setting in with the demonetisation a year ago, since most of the transactions here are done in cash. Labour became scarce because many of the workers do not have bank accounts and owners were paying them in demonetised currency as their weekly payment. There was also a sharp fall in business and those who left this line of employment have not returned. Then came the GST rollout and unregistered powerloom factories were forced to buy their raw materials at 18 per cent GST. They also had to bear the 5 per cent GST of their buyers, the clothes shops in flea markets. Weavers are at their mercy because there are no fixed contracts instead deals are struck on rates they can offer the buyer. One of the bigger merchants on Avenue Road, who takes 400 sarees a week, says “There are no contracts, we take the sarees as and when we need them… I give 5% GST on sarees I buy from them, but the others are most likely not". Raw material suppliers refuse to transact without payment of the GST and bigger units like that of Umashankar’s, which runs 8 powerlooms and makes 16 sarees per day, can absorb this. “We have registered our company now and have started buying raw materials by paying GST,” he says, but he has trouble paying the workers. “Workers insist on being paid in cash, they do not have bank accounts. But GST does not allow that,” he says, adding that he is losing labour from these new rules and fall in business. 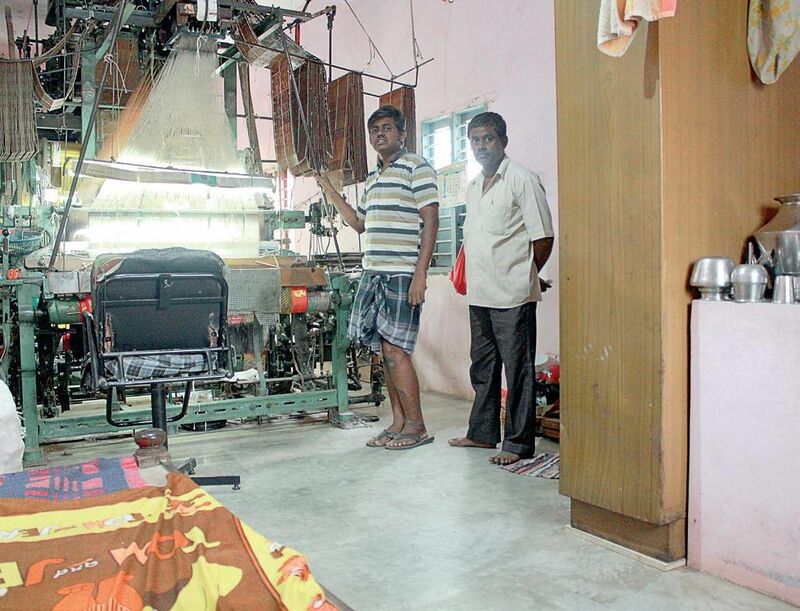 Somashekar, owner of a unit, says “ Earlier I used to make three sarees a day and earned well. Now I can’t make more than one saree a day”. He says if this continues, he may have to try another line of business like the others.Krishnappa has been working for 52 years now. “There was a time when youngsters used to throng to work in powerlooms, but not any more. Once you are a weaver, you remain a weaver. This industry may very well die out in next 15 years”. Many of these workers and owners have known each other for generations, and there is a sense of community in this business. Ravi, who was employed as a weaver at one of the units, says, “I am emotionally attached to this job but I had to quit a few months ago. I worked as a driver and delivery boy, and now I am out looking for work”. Saraswathi has been working two looms with her husband for the past 25 years. She says, “We do not have savings and our children's education has become expensive. But weaving still brings in the same earning as it did 10 years back. How can that be enough?”. Sarswathi's husband Suresh signed up as a security guard at a private firm, after demonetisation. Suresh says, “I worked as a security guard in Koramangala but employers there do not respect you. Here you are the boss and people address you with respect as ‘anna’, there they shout out for you.” He left after four months and has decided to try his hand at powerloom business once more. In the forties and fifties, handloom units mushroomed in Cubbonpete, Chickpete and Gaythri Nagara. In the 70s, powerlooms swept out these units. But these were noisy and residents complained of it. They were forced to move out to the then outskirts of the city in Kamakshiplaya, Kamalanagara, Kare Kallu and Vrushabhavathi Nagara, and these were chosen because of the connectivity to centre of city through Magadi Road. Arun Prasad, an independent researcher and historian, says "Once upon a time, handloom units were doing well in residential areas. Then the powerloom units moved the weaving industry out of the city."